Last Mile Marker "P 1 m"
Another face of the same marker, "LS 30 m"
The highway that runs from Perrysburg (south of Toledo, Ohio) to Fremont (south of Sandusky, Ohio) is state route 20, the Fremont Pike. 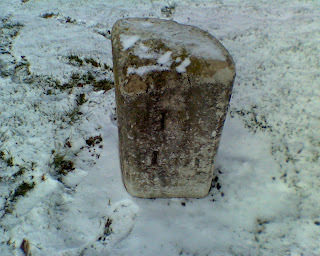 Frequent travelers along this road might occasionally notice squat, triangular stones along the side of the modern roadway, that look somewhat like lonely tombstones. These stones are the remaining mile markers that trace the old turnpike between the village of Perrysburg and the settlement of Lower Sandusky (Fremont) (which grew up around the old fort where Major George Croghan and 160 men from the 17th Infantry Regiment defied an entire British expeditionary force). In the old days, this route cut directly through the Great Black Swamp of Northwest Ohio, and was known as the worst road in America. Given that most early American roads were actually little more than muddy tracks, this was a dubious honor indeed. Since in many places the swamp was ankle or waist deep, trees had to be felled across the road bed to create a passable trail for carriages and wagons. Nevertheless, the going was so slow for most travelers that enterprising locals created inns along the way: according to one source, at one time there were 32 inns spaced along the 31 miles separating Perrysburg from Lower Sandusky. 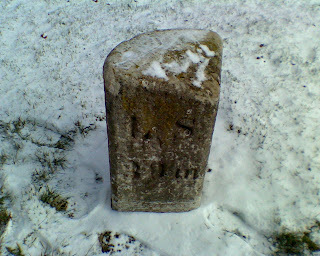 The milestones were set in place in 1842, once the road had been improved. According to a brochure produced by the Woodville Historical Society, of the 30 original milestones, 23 of them are still in place, and the remaining 7 were recreated with concrete replicas. This stretch of State Route 20 is the only one left in the United States with a continuous string of milestones, once a common sight for travelers.